I packed away the last bit of clothes i had pulled out for the camping trip. i zipped my bag throwing it over my shoulder and making my way to the front door where i dropped it off. I then made my way to jack&apos;s room to check on him make sure he was getting everything he needed for the trip. i peeked in his room finding jack on top of his bag growling. i couldn&apos;t help but chuckle at the sight of him, he stop noticing me in the doorway. i smiled coming closer. "Jack if you needed help you could of asked." jacked huffed sitting down next to the bag as i came over. i grabbed the lip of the zipper pulling it close. "there now zip it." jack grabbed the zipper  pulling it closed with ease. "see, now its closed." i smiled sitting next to jack who smiled. he leaned over laying his head on my shoulder. he was so cute..
"Mark, Did i ever tell you that you&apos;re the best pillow. I could take a nap on your shoulder." i chuckled wrapping an arm around him and pulling him closer. "well maybe on the trip, but for now we better get the bags in the car before the others get here." jack whimpered a bit when i stood up. i smiled shaking my head as i grabbed his bag taking it to the front door, with jack following. i grabbed my bag and stood back as jack opened the door for me. "Oh thank you kind gentleman." jack stood a little taller smirking. I laughed setting bags down so i could open the back trunk. footsteps behind me made me look up from the trunk. Felix and cry waved carrying their camping. i smiled waving at them, jack smiled greeting them. it was nice to see him happy, him actually smiling as if everything was okay. it wasn&apos;t easy seeing him being torn apart, it broke my heart. Watching someone close and love fall apart in your hands, its not only devastating for them but for you too. unable to truly tell them that its okay, that it will get better when in truth you, yourself don&apos;t know if it will. It was these small moment of him smiling and laughing like when i first met him in my tech class that made happy. It was these moments that made our forbidden relationship worth everything, worth every risk we took. I wouldn&apos;t take any of it away for anything. Felix and cry sat in the back seat playing tic-tac-toe, with cry winning by 15 to Felix&apos;s 0. I sat up front  with Mark playing teasing him on how he would look awesome with his hair dyed. "Jack i&apos;m telling you i would look ridiculous with my hair dyed! I&apos;m just someone who couldn&apos;t pull it off. "I smiled"Well I&apos;m telling you that, you would down right fabulous with your hair dyed! i mean maybe a Blue or red? hey even pink!" Felix leaned forward smirking. "Mr.Fishbach if i may say, i think your hair dyed pink would be straight awesome" Mark waved him back while still keeping his eyes on the road. i laughed. "Mark you&apos;re just sassy cause you know we&apos;re right." Mark glanced over at me then smiled. "Okay jack. i have a proposal, If i dye my hair Pink, then you have to dye yours neon green, since that seems to be your oh so favorite color." Mark smirked.I looked at him shocked. I tried to imagine myself with bright green hair but i just couldn&apos;t see it. i shook my head. "Oh no, i didn&apos;t say anything about my hair, i said yours." Mark laughed. "Well, i guess I&apos;m not going to have Pink hair." I sat back thinking, I heard Felix and cry shuffle closer. "Come on jack, i think it&apos;s worth a shot. you green and him pink, i think it would be cute. "Cry nodded and i could tell he was smirking under that poker face mask of his. 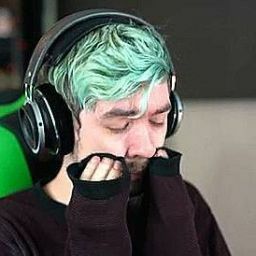 "Jack if i may say, i think Green hair quite suits you, its a strong vibrant color.perfect for your bursting and energetic personality." i heard Mark hum in agreement. i couldn&apos;t say no now. 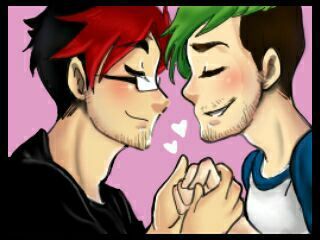 "I guess, but only if Mark really does dye his hair Pink!" Mark chuckled." of course, i wouldn&apos;t go back on a agreement would i?" he smiled rising a eyebrow at me. i rolled my eyes, sitting back . i crossed my arms. "I guess im going to be green guys!"